The 23-date trek kicks off July 7th at the Concord Pavilion in Concord, California and concludes August 8th at the Riverbend Music Center in Cincinnati, Ohio. Tickets will go on sale April 3rd, while more information will be made available on the Pumpkins’ and Manson’s respective websites. A full list of tour dates is below. 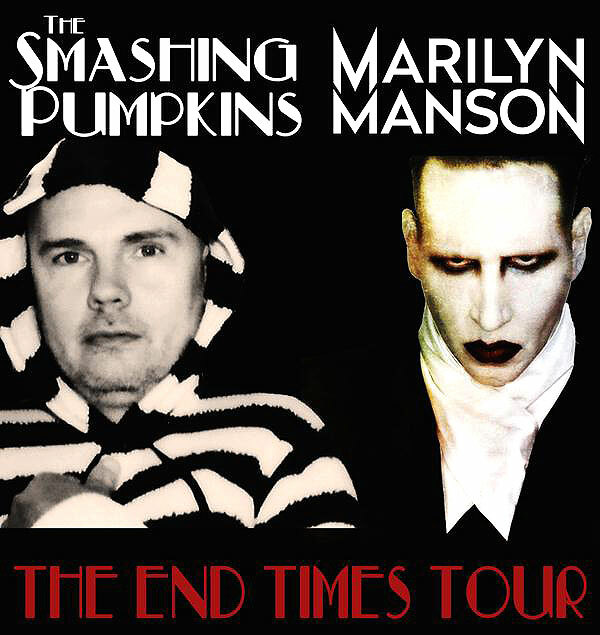 While Manson has spent a good chunk of 2015 on the road in support of his latest LP, The Pale Emperor, The End Times tour will mark the first significant set of live dates for Smashing Pumpkins following the release of their eighth album, Monuments To An Elegy. Billy Corgan and Co. did play a handful of shows upon the album’s release last December, with Rage Against the Machine drummer Brad Wilk and Killers bassist Mark Stoermer comprising the band’s rhythm section; no word yet on whether they’ll rejoin the Pumpkins this summer.